Sol:-There are two sequences arranged alternately. In each sequence the number is the square of the previous number in that sequence. 6,561 is the square of 81. Puzzle 2:- Which Number is Odd Man Out? 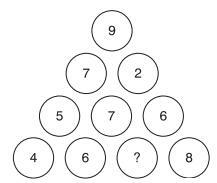 Puzzle 3:- What number should replace the question mark? Puzzle 4:- What number should replace the question mark? Sol:-The numbers in each line contain the digits 1 – 9 only once. Puzzle 5:- What number should replace the X? Sol:-Space the Seriese Correctly.Seriese will become 13,15,17,19,2(1).